Online test scoring jobs are at the top of my favorite work from home positions I have tried over the years. Getting paid to score essays from home can be an interesting way to earn extra cash especially if you are looking for a flexible, non-phone work from home job. Learning how to make extra cash from home is a great option for those who do not have the time for a full time work from home position. These online test scoring jobs are not usually year round, making these positions seasonal but a great opportunity for those that could use the extra income without the commitment of a full-time work at home job. Read further to find out of scoring essays online would be a good fit for you. Online Test Scoring Jobs: What Do You Do? Online test scoring jobs can be a convenient way to earn some extra cash seasonally. Most standardized tests have an essay or written portion that students are required to hand write. While the rest of the test can be automatically graded by computers, the handwritten portions require a human element. The essays and hand written portions are scanned into the computer where essay graders can access them from home. A standard grading scale is practiced in training by essay graders and used to grade these essays. Elementary standardized tests may have simple handwritten words or sentences needing grading while college level exams will have lengthy essays. Once you are hired by one of the companies you will be notified when a testing period is coming up. Most standardized tests are given towards the end of the school year making the spring and beginning of summer pretty busy. Once you know a testing period is coming up you can go in and schedule yourself for as many hours as you would like. These companies usually require you to sign up for shifts in blocks of a few hours or so but besides that you can do as little or as much as you would like. You don’t have to be on the phone for this type of work from home job so it is a great work from home job for moms with kids. How Do You Get Hired for Online Test Scoring Jobs? The background needed for becoming an online test scorer depends on the standardized test. The lower level tests usually hire anyone with a college degree while the higher level tests usually require a teaching degree, sometimes even a graduate degree. Check the specific test applications for further info on necessary requirements. You must have your own computer with up to date software before being hired. Once you apply with each company if you hear back from them and start the hiring process then you will have a chance to review training materials and learn the way the different tests are scored and have a chance to practice. Many of the companies require you to pass a trial scoring session before being hired. What Companies Hire People for Online Test Scoring Jobs? These companies below hire people to work from home to help grade the essay portions or writing portions of standardized tests. These companies score for many different types of standardized tests from elementary school all the way through college. ETS Scoring Online- ETS employs raters to evaluate essays online for many different testing agencies. All require a bachelors degree with some requiring previous teaching experience or a master’s degree. Scorers are part-time employees who are Readers for the College Board’s Advanced Placement® (AP®) Program or other testing programs, and/or Raters associated with ETS’s TOEIC®, TOEFL®, Praxis® and GRE® programs. Work schedules are varied and cyclical throughout the year, depending on the number of test takers and test administrations. Pearson Online Scoring -Pearson hires for online test scoring jobs. A bachelors degree only required-not in any specific field. This company does offer scorers health insurance which is very unique for companies that hire for part-time work from home positions. Pay range is between $12-$13an hour. 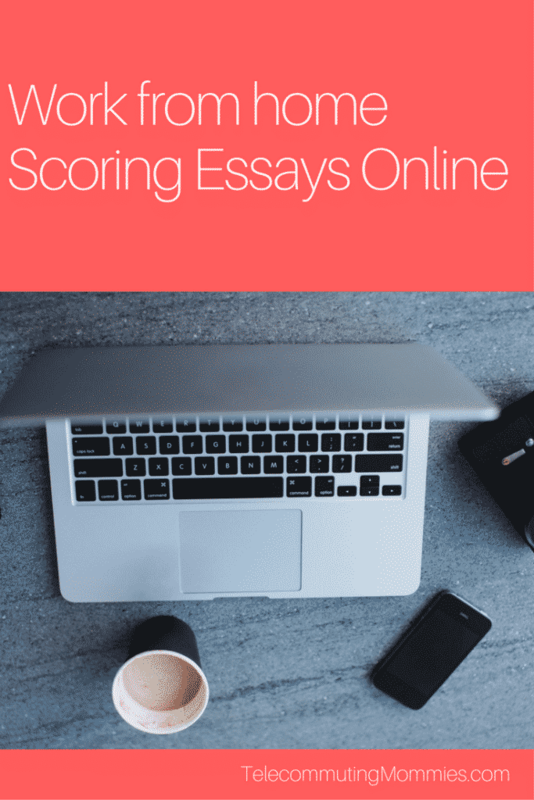 SAT Online Scoring– Score essays for SAT test. You must have a bachelors degree and have teaching experience at high school or college level. These online test scoring jobs are not year round but during the scoring time periods you are required to work at least 20 hours a week. ACT Online Scoring– Score essays for the ACT test. You must have a bachelor`s degree with those with a teacher`s certificate preferred. Essays are scored at intervals throughout the year. Compensation will be performance based. Scorers can realize $12/hour or more based on a combination of performance indicators, including quality and rate. WriteScore– Write Score is an educational company that helps administrators, teachers, and students use assessment data to promote academic achievement. This company provides standard-based assessments and occasionally hires online scorers to grade these assessments. Write Score has scorer positions available throughout the school year and the position requires scorers who have a 2-year college degree and pass the final qualifying test. Measurement Inc– Offering products geared towards testing and evaluation, this company hires virtual scorers to assist in grading these tests. This is temporary, project-by-project work, concentrating from March to June. Proof of a bachelor’s degree (any field) from an accredited college or university or an equivalent foreign degree verified by an educational equivalency agency is required. Completion of a satisfactory writing sample and successful interview along with professional references needed before being hired. Readers are hired on a temporary basis, by project, but are expected to work five days per week, Monday through Friday, for the duration of the project. Attendance during training is mandatory and regular attendance throughout the project is required. Remember that many of these companies have varying scoring periods so if you are in need of more consistent work you could actually work multiple online test scoring jobs. Otherwise, if you are looking for a very flexible way to make some extra cash without the commitment of a long term work from home job then this is a perfect opportunity for you.